Notes: Renesse Castle is a castle located in the village of Oostmalle (Malle), in the Campine region of the province of Antwerp (Flanders, Belgium). It is currently owned by the municipality of Malle. 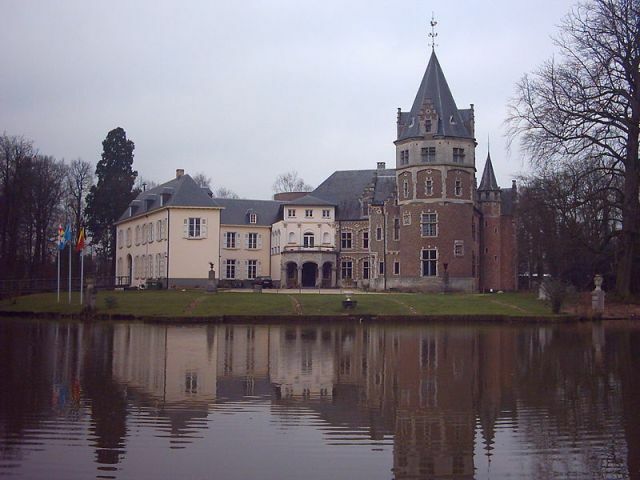 After World War I, Maximilian started rebuilding the castle in Flemish Neo-renaissance style. However, construction was stopped after completion of the right-wing of the castle. The 16th century left-wing remained as it was, but was no longer used to live in. During both World War I and World War II, the German military occupied the castle. On 15 March 1941 a British bombardment destroyed part of the left wing of the castle. Towards the end of the war, in 1944, the castle was used by British and Canadian forces as a hospital. The tornado which devastated Oostmalle on 25 June 1967, spared the castle but the damage in the park remains visible until today. Count Thierry de Renesse-Breidbach, who had been mayor of Oostmalle since 1933, died on 24 October 1973. Ever since his marriage with Clara Van Gelder, he no longer lived at the castle and had been contemplating selling the castle to the village of Oostmalle. It took until after the union of Oostmalle and Westmalle in 1977, before the castle was acquired by Malle. On 16 May 1983 the castle and the domain were acquired by the municipality of Malle. Since 25 March 1985, the castle and its surroundings have been owned by Domein de Renesse a non-profit organization responsible for the administration of the castle, and is now being used as a museum, for cultural activities and concerts.